I forgot to tell you about this in the last update . . .
Whew! I think I've caught up . . .
. . . at least with the announcements, anyway. I still have lots of new DIY stuff to read, & hopefully find time to review here. I should also mention that Kate Greenstreet's fascinating first-book interview series continues apace at her blog Every Other Day, featuring recent chats with Raymond McDaniel, Simmons B. Buntin, & Aaron Kunin. The press is small, the game is big & the sides are tiny . . . In the first lot of tinysides, we explore movement towards and away, with a distinctly American kick. We start with Jessica Smith's butterflies, which senses migration between continents, between vision and action, and grounds time in its own ephemerality. Next, we take a cross-country trip with Dustin Williamson, feeling the displacement of flight (and counting sevenhundredandtwentyfive baseball diamonds between here and Muncie). Stephanie Anderson, driven by abecedarian fervor, taps into America's love vibration, only to let Jordan Davis equate it to our empty, empty, empty, empty consumerist lives. Finally, Mark Lamoureux gracefully points out that it's not just the people, but the places, that we've let get spooky, what with all our restlessness. Take a trip across, back, under, over, and through the tinysides. A buck a pop, or all five for a mere $4.50. Oops: some have already sold out. But you can still get the remaining tinysides as a discounted set! Maureen's already at work on Tinysides 6-10, naturally. The new issue of Diagram features work by Amy Blache, S. Burgess, Naomi Clewett, Stephanie DeHaven, Josh Hanson, Matthew Hittinger, Anna Journey, Dawn Cunningham Luebke, Mark McKain, Peter Orner, Dan Pinkerton, Claudia Ryan, Morgan Lucas Schuldt, M. B. Seigel & Abraham Smith, as well as reviews of new books by Danielle Pafunda, Misty Harper & Sam Savage. Like doctor's offices, certain dogs, human relationships, and words themselves, the poems in Danielle Pafunda's debut collection Pretty Young Thing look innocent enough from a distance. It's an illusion easily shattered by sticking your nose in. From first blush to last, these blunt, racy, sometimes alienating lines wipe that little-boy smirk off the book's title and assume a kind of intimacy that's not always comfortable, and frequently cutting. * Full disclosure: Why yes, I did happen to edit this book for Soft Skull. & I think you would like it. On February 14, 2006, a new website for the small press community launched at www.smallpressexchange.com. This site was conceptualized, programmed, and designed by myself, with the help of my co-publisher at Ahadada Books, Jesse Glass, [and] was envisioned as a loose affiliation of writers, booksellers, and small press publishers. Keep us in mind when you have an announcement, event, or title to promote. If you care to register, you may submit your announcement automatically through a form at the site. If you care to link to us, you may find images, banners, etc here. The Small Press Exchange is the most comprehensive online portal into the small press. Our mission is to provide publishers, librarians, booksellers, authors, and general book enthusiasts with the resources they need. Our users benefit from access to various tools and services. Read small-press reviews, events listings, announcements, calls for submissions & other news, create a profile for yourself or your press and browse others' profiles, search for a local independent bookstore, submit your books for review, etc. The Small Press Exchange has also been added to the resource links in the sidebar. Cool. & it looks like fun was had by all, with performances by Rachel Kushner, Damon Krukowski, Wayne Koestenbaum, & a sound/video presentation by teleseen. A taste: Wayne Koestenbaum, "the diminutive, ultra-stylish professor/poet/critic" read from his work-in-progress called Hotel Theory, "a split-column book: one column a theoretical meditation on hotel rooms; the other a cheeky novel, starring Lana Turner and Liberace, among others, centered on the fictional Hotel Women in LA. A potentially disastrous formula, to be sure, but like all of Koestenbaum's work, it gracefully balances hard-won philosophical concepts with a genuinely funny camp wit." & copies of Soft Targets are still available here. Coconut 5 is fresh . . .
With new poems from Mong-Lan, Ashley VanDoorn, Ada Limón, Scott Glassman, John Cotter, Lyn Hejinian, Joshua Marie Wilkinson, Katie Degentesh, Gina Myers, Dustin Williamson, Johannes Göransson, Noah Eli Gordon, Kristen Hanlon, Matt Hart, Kirsten Kaschock, Jennifer Moxley, Sarah Mangold, Carly Sachs, Joshua Edwards, Michael Rerick, Jen Tynes, Albert Flynn DeSilver, Maureen Seaton, Neil de la Flor, Hal Sirowitz & Robyn Art. Crack it open with your machete & get slurping here. There are 5 poems in the deep, & it is decorated with toothy fish & endorsed by Abe Lincoln. I could quote the whole chapbook here, but will not, & so you're just gonna have to wish hard that her book A Romance of Happy Workers from Coffee House comes out a lot faster than promised. & be on the lookout for her chapbook Good Apocalypse too, forthcoming from Effing Press. Or maybe she still has some copies of The Deep, but there were not that many, not nearly enough. Crossposted from the other blog. 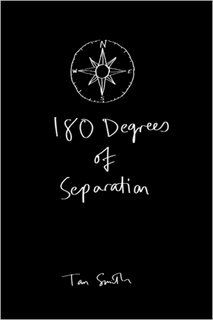 Tom Smith announces the publication of his bitterly humorous poetry collection 180 Degrees of Separation. Tom Smith woke up one day thinking entirely in rhyme. This strange affliction lasted for a year, a year in which he discovered that his wife had been having an affair, in which he went looking for meaning on the other side of the world only to break his back in a mountain-biking accident and in which he nearly died from a broken heart--literally. If you’ve ever gone through a relationship break-up, this dry, wise, witty and sometimes just plain silly take on life--together with illustrations from the author’s notebooks--will have you rolling around on the floor. Tom Smith is Milligan on a ukelele. Try him. Or stop by Tom's site for more info. New website & new call for submissions from Cy Gist! I am happy to announce the call for submissions for its second chapbook anthology, Face Time. Face Time will focus on poems written to accompany film or television stills. Submissions should be accompanied by an image of the still of 400 DPI or greater (snailmail submissions may simply include a copy of the still—I can do the scanning myself). The chapbook itself will be black and white, although I can convert color images. I will not be able to consider submissions unaccompanied by images. As always, feel free to alter the images themselves if you so desire. Send submissions as MS Word documents or PDFs to: mark_lamoureux [at] yahoo [dot] com. or to 25-16 41st Street, Apt. 2f, Astoria, NY 11103. The reading period is from the time of this announcement until August 20, with the chapbook being completed sometime in August. Payment will be 2 author’s copies.